Expect dry and warm weather for the Lunar New Year holiday period. Short-duration thundery showers are expected in the afternoon on 4 – 6 days. On some days, daily max temperatures could reach a high of around 34oC. Singapore, 1 February 2019 – In the first fortnight of February 2019, the prevailing Northeast Monsoon conditions are forecast to persist, with the low level winds blowing predominantly from the north or northeast. Compared to the occasional breezy conditions experienced in January 2019 where mean wind speeds were between 15 km/h and 30 km/h, the low level north or northeasterly winds in the first fortnight of February 2019 are forecast to be weaker, with mean speeds of up to 20 km/h. 2 The dry weather experienced in the last fortnight of January 2019 is expected to continue into the first fortnight of February 2019. During this fortnight, localised short-duration thundery showers due to strong day-time heating of land areas coupled with convergence of winds, can still be expected in the afternoon on four to six days. The rainfall for the first fortnight of February 2019 is expected to be near-normal. Climatologically. February is the driest month of the year. 3 In the first half of February 2019, warm conditions can be expected during the day time on some days due to light winds, few clouds and solar heating of land areas. The daily temperatures are forecast to range between 24oC and 33oC on most days, and on days when there is little or no rainfall, the daily maximum temperature could rise to a high of around 34oC. 4 For the Lunar New Year holiday period, fair and warm conditions are expected, and the daily temperature is forecast to range between 24oC and 34oC. 6 Northeast Monsoon conditions prevailed in January 2019. During the month, the low level winds over Singapore and the surrounding region were blowing mostly from the northeast or northwest. On a few days in early January 2019, there was a shift in the winds to blow from the west under the influence of Tropical Storm “Pabuk” that was brewing over the northern part of the South China Sea. 7 January 2019 was a relatively windy and dry month. In the early part of the month, it was also warm. The warm weather can be attributed to strong solar heating and low rainfall due to stable atmospheric conditions over our region under the influence of Tropical Storm “Pabuk”. 8 Climatologically, January is a wet and cool month. While most of the showers in January 2019 fell around the middle of the month, the rain that fell over Singapore in January 2019 was significantly below the climatological average. In the second week of January 2019, the thundery showers fell mainly over the western half of the island, and the eastern half was generally dry. In the third week of the month, a surge of strong monsoon winds over the South China Sea resulted in a convergence of winds over the equatorial region, which formed part of the monsoon rain band This brought cloudy conditions and occasional showers on a few days over Singapore and the surrounding vicinity. In particular, the surge brought cool and cloudy conditions and a few spells of showers to Singapore between the night of 17 January 2019 and the morning of 18 January 2019. A shift of the monsoon rain band to areas further south of the equator brought a return of dry weather over Singapore till the end of the month. The highest daily total rainfall recorded in January 2019 was 71.8mm at Thomson on 12 January 2019. 9 The first half of January 2019 was warmer than the second half of the month. While it was windy throughout the month, the stronger winds in the second half of January 2019 brought some respite to the warm conditions experienced earlier in the month. In the first fortnight of January 2019, the daily maximum temperature ranged between 33.1oC and 34.8oC compared to that in the second half of the month which was between 29.2oC and 32.9oC. The highest daily maximum temperature of 34.8oC was recorded at Choa Chu Kang on 12 January 2019. The lowest daily maximum and minimum temperatures of 29.2oC and 22.5oC respectively were recorded at Choa Chu Kang on 18 January 2019. 10 At the climate station in Changi, the mean monthly temperature for January 2019 was 28.0°C, 1.5°C above the long-term average. This makes January 2019 the second warmest January since 1929, 0.1°C below the record set in January 2016. The daily maximum temperature of 33.4oC was recorded on 1 January 2019, which is the third highest daily maximum temperature recorded at the climate station in the last 10 years (2009 – 2018). The monthly total rainfall of 63.6 mm recorded in January 2019 is the fourth driest January in the last 30 years. The top three record lowest monthly total rainfall for January (in the last 30 years) are 15.4 mm (1997), 38.3 mm (2009) and 56.9mm (1994). 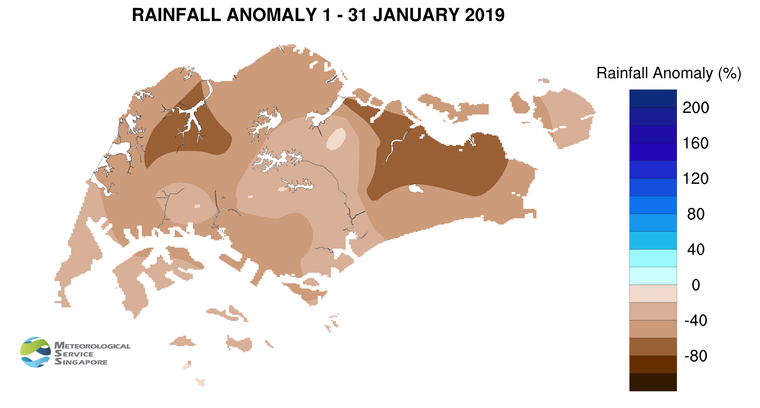 11 Singapore received significantly below-normal rainfall in January 2019. The highest rainfall of 151.8mm (35% below average) was recorded at MacRitchie. Rainfall was lowest at Tai Seng where 55.8mm (76% below average) was recorded.